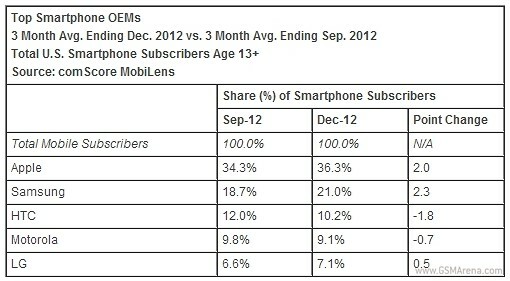 The latest comScore mobile market share report for the US shows the trends from the previous trimester continue into the three month period ending in December 2012. Some 125.9 million Americans own smartphones in the US, with Apple and Samsung still duking it out over the lion's share of the market - both have gained 2.0 and 2.3 points to control 36.3% and 21.0%, respectively, of stateside smartphone handsets. 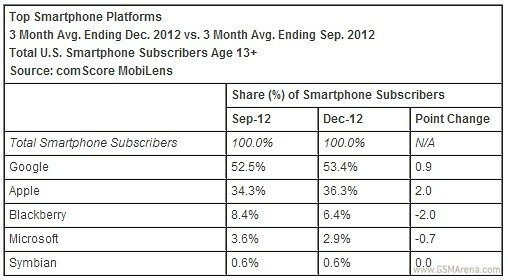 The mobile OS wars are, as usual, between the two usual contenders in the form of Android and iOS. And it's becoming even more of a two-horse race as the two combine for almost 90% of the total smartphone market, although Apple has seen more growth during the three month period (due to the release of the iPhone 5), going up 2% compared to Android's 0.9%. Meanwhile, BlackBerry went down 2 percent points to close out the year at 6.4%, and Microsoft's Windows Phone OS slid 0.7 percent points to just below the 3% mark. yeah im with the other guys - it would be nice to see more data for other counties, worldwide ideally.